It probably won't come as a big shock to say that I'm a big Indiana Jones fan. When Raiders of the Lost Ark came out, I was absolutely blown away by the adventure, the excitement, and the fun of the movie! My friends and I went to see the film over and over again in the theaters, and we had fun re-enacting the movie scenes in our backyards, neighborhood fields, beaches, and even abandoned buildings that we'd sneak into to explore. Yeah, I know...that wasn't very safe! I even made my own Halloween costume that I wore several times -- and I'm not afraid to say I even wore it on non-Halloween days at times. (yeah, I'm a big geek). I even have a friend that we would write letters to signed as "Indy" and "Marion" throughout our high school and college years. Although Kenner's action figure line has been featured here on Cool Toy Review before, I suppose I was feeling nostalgic this week, so I wanted to turn the CTR spotlight back onto this classic toy line, which was really ahead of its time with articulation and soft goods. There were 9 action figures in the line, including a nice mix of heroes, villains, and lots of snakes! Okay, so the horse isn't a vehcle, but it's included here anyway. These two were enough to re-create the classic scene from the film, as Indy races to recover the stolen Ark. I actually never got these myself, but we've got them added here, thanks to some of my fellow collectors. As a kid, I had hours of fun recreating the adventures from the movie, so much that I even designed my own playsets of out cardboard boxes. 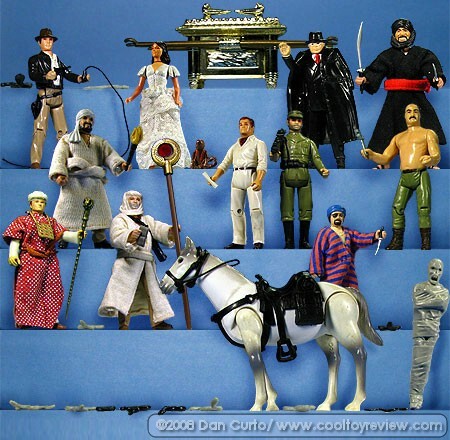 These were no mere shadow boxes or dioramas, but were real, working playsets with action features, traps and more. I had the Temple, the Well of the Souls, Captain Katanga's boat, and even the island at the end of the movie. I sculpted Play-Doh for the Fertility Idol, used an old softball as the boulder trap, and old pencils were spikes that really came through the wall...all painted and held to gether by glue, tape, and string. Sadly, they were lost when my family moved. But they were fun to create, and they were some of earliest attempts at customizing that later became a big hobby for me. There was also a 12" figure, a board game, and a few other items in the line, some of which can also be found in our Photo Archive. Also worth noting are the Walt Disney World theme park exclusive figures that have appeared over the years. Not quite as elaborate as the Kenner line, but we've got them as well...check them out by clicking on the thumbnails below. Another quick update this week, as once again I've had to shuffle some things around, since I was busy shooting the latest toys this week. But it's not like I needed an excuse to showcase these classic Indiana Jones toys. After all, they do belong in a museum, right? Very special thanks to my pals Rick, Andy and Rich for their help in getting this line together back in January. I hope you had fun revisiting with some old friends.